Integration, communication, and collaboration between development and operations are both difficult and critical for efficiency and reduction of production deployment risks. Experts will tell you that without a comprehensive continuous integration and continuous delivery (CI/CD) process, you are unlikely to finish the work you spec during your Sprints. In addition, automation of the build, test, deployment process significantly reduces downstream surprises and costly debugging time during product releases. Our DevOps experts can work directly with your team to help reduce build integration and configuration issues and improve efficiency and quality. Transformation to a DevOps model is not a one size fits all approach. While there are plenty of automation tools and frameworks for improving your release process, what works best is only discovered through an iterative improvement process. Besides instilling DevOps process discipline and tooling, successful transformations must also tackle cultural, organizational, and people-skill issues. 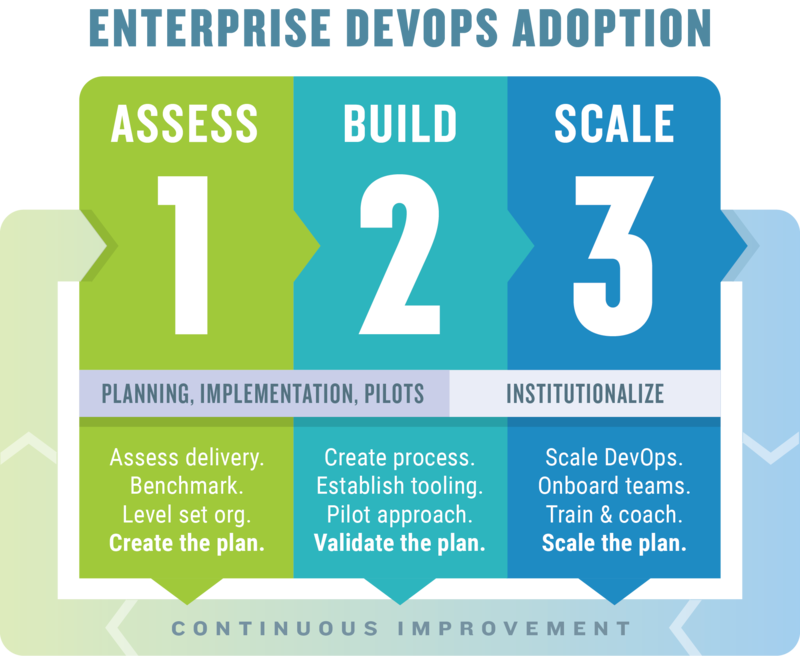 Coveros has experience helping organizations of all sizes transition to DevOps. Our certified DevOps consultants have expertise in leading an organization through an enterprise-wide transformation as well as experience with a wide range of build, test, and deployment automation tools. Coveros consultants offer years of hands-on expertise in many of the DevOps tools, environments, and frameworks using to implement pipelines today including: Jenkins, Git, Subversion, Maven, Chef, Puppet, Ansible, Docker, Kubernetes, Sonaqube, AWS, and Azure. Continuous security is a key component of building releasable software on a frequent basis. Coveros has been engaged in integrating security tools into continuous integration and continuous delivery processes for a decade. Coveros coaches do more than facilitate. We are believers that your staff learns best by doing alongside others who have done it before and can model proper behavior. Our coach practitioners pair with and mentor your staff to accelerate their improvement.